Cartoonist Kevin Bolk turns the tables on a sexist pormotional poster for The Avengers. 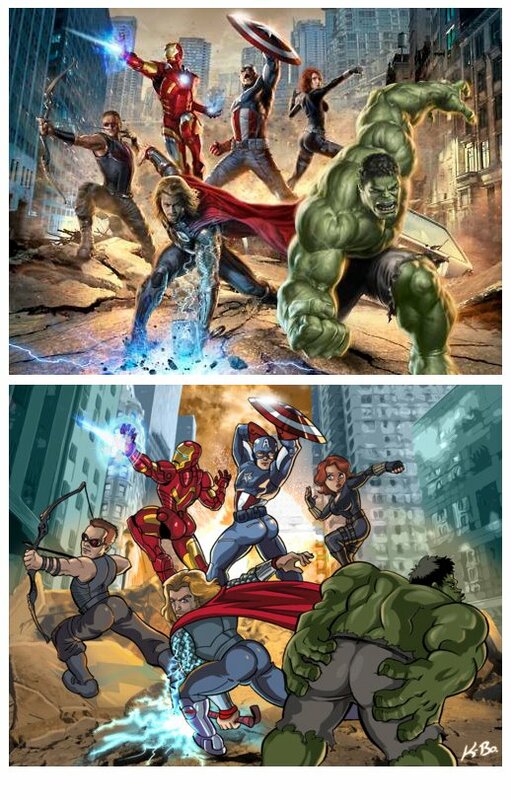 What if the male comic book characters posed like the female ones? In the wake of The Avengers setting box office records, thousands of Facebook users are laughing at a reimagined movie poster. In the original promotion, only Scarlett Johansson’s Black Widow—out of all the assembled superheroes—shows off her rear end. One artist has turned that around entirely. In the image, Captain America, Thor, Hawkeye, Iron Man all contort awkwardly for your viewing pleasure. The Hulk, in particular, seems confused by his involvement in this picture, bending over and grabbing his rear in what looks like misguided seduction. The cartoon’s author, Kevin Bolk, goes unmentioned in the share, and his signature in the bottom right is unreadable if you’re not familiar with him. That doesn’t bother him too much, though. A professional cartoonist, Bolk said he’s well aware that there’s a double standard in how men and women are presented in superhero comics. “I often hear the counterargument that ‘Oh, well, men are objectified just as much as women because they are muscular and wear tights,’” he wrote in an email. It’s unclear if everyone who shared the cartoon on Facebook understood Bolk’s intent. They seem to have all gotten the humor, though. “Nice duckface on hulk,” Nick Smith commented. “Growing up I always had nightmares about the Hulk…maybe now my night terrors will mainly feature my mortal fear of the Hulk doing a ‘silent but deadly,’” Christine Harrison replied.